Join the discussion on our forums! Come discuss Voodoo Hexxer over in our dedicated Voodoo Hexxer discussion topic. Good card for any Elemental deck that is not running the Jade package. Add the freeze package which synergizes better with Elementals. http://www.hearthpwn.com/decks/874168-kft-frost-elemental thoughts??? I'm definitely going to give this a "very good" rating. It's not meta defining by any means (not unless Thrall Hero is amazing), but being able to take out an attacker for two turns, even if it just kills this card in one attack, is nothing to sneeze at. Another versatile taunt for Shamans. Thank you Blizzard. If priest will be good this card likely won't be. This is a technically a better version of Water Elemental. It has taunt so minions must attack it and it has very good stats as well. Definitely we will see this card in many decks. It is also great for arena as well. 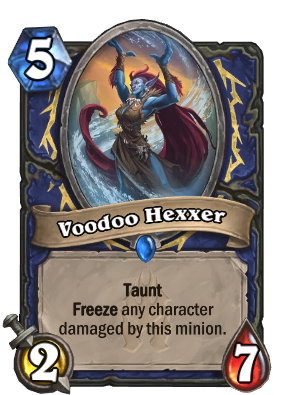 But, in order to work with Ice Breaker, shaman needs more freeze cards. This card, and most missed it, is an indirect nerf to Stonehill Defender when used in a Shaman deck. OK it's an Alley Armorsmith with freeze, not bad. but will it replace Thing from Below? No, because do you see this thing 0 mana outside Emperor Thaurissan? No. Maybe the class legendary can be a Troll? Vol'jin is a card. Is it just me or is the first d in damaged just BARELY overlapping the outline around the yellow attack circle? so kinda like a water elemental... but with taunt for 1 additional mana and slightly more health for less damage. that said 2 mana at 5 mana seems a tad weak for the effect. The dream I suppose is that 7 health puts it outside of your enemy's spells and also makes it more likely to freeze at least one enemy minion. At which point, Shaman can instantly kill it with their new weapon. This is a dream scenario, but I'm kinda liking the idea of a really slow grind shaman and hope that more cards support this playstyle in Shaman.